Zach Haas won his fourth Northern League singles title on Saturday, Oct. 13. Haas will look to tie the state record for most singles state championships, when he goes for his third consecutive title next weekend. After capturing regional team championships earlier in the week, Truckee’s tennis players added more hardware on Saturday, competing in the Class 3A Northern Region Tennis Championships singles and doubles tournament. Senior Zach Haas dominated the field on his way to a fourth regional singles championship, while fellow seniors Noah Warren and Zach Larson defended last year’s Northern League doubles title by defeating teammates Turner Drummond and Elliot Rost in the finals. Haas’ place as one of the greatest players in Nevada Interscholastic Activities Association history is already secure. 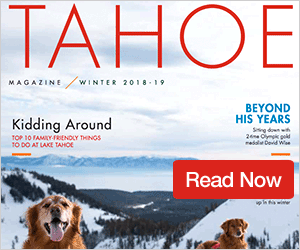 The Truckee senior is the two-time defending state champion in singles and hasn’t lost a match on the high school level since finishing as runner-up in the state championship finals his freshman year. A third state championship next weekend would equal the most ever by a male player in singles — a feat accomplished by only three players. Haas was flawless during Saturday’s semifinal and final rounds, defeating both opponents, 6-0, 6-0. 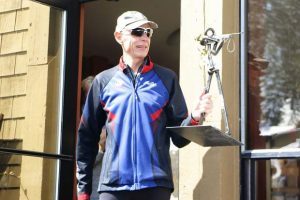 He will close out his career at Truckee next weekend at the Tahoe Donner Tennis Center, where he will chase history in an effort to become the most decorated player in Class 3A history. Each of the three players to win a trio of singles state titles played on the Class 4A level, and was last accomplished by Reno’s Brandon Kramer, who won state titles from 1992-94. Haas will be joined at the state singles tournament by teammate, junior Luke Sorter, who finished in third place. Sorter and South Tahoe’s Juan Vazquez battled it out in a spirited third-place match, which Sorter won 6-2, 6-4. Incline’s Dalton Fry finished as this year’s runner-up, and will round out the four players representing the Northern League at next weekend’s state championship singles tournament. Defending Class 3A state and Northern League doubles champions Warren and Larson hadn’t played together at all leading up to this year’s regional doubles tournament. Larson and senior Sawyer Laine were solid all year as doubles partners, while Warren tried his hand at singles, before going down with an injury. After Truckee took the team regional title earlier in the week, Larson and Warren reunited to defend their Northern League doubles title at this weekend’s tournament. The two picked up right where they left off last year, cruising through the first two rounds Friday, dropping just one game. Larson and Warren went on to win 6-3, 6-2 against South Tahoe’s Clyde Rypins and Jeremiah Dahl to set up an all Truckee final against seniors Turner Drummond and Elliot Rost. Drummond and Rost played well but fell to the reigning league champions, 6-0, 6-2. 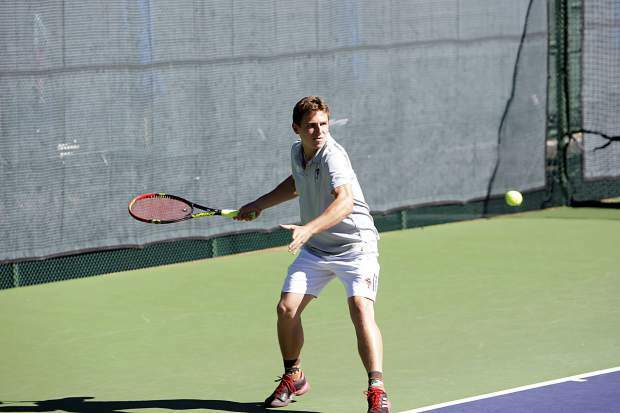 The two Wolverines doubles teams will represent the Northern League, along with South Tahoe’s Dahl and Rost, and the Vikings’ Quinn Proctor and Pete Sullivan, at next weekend’s state championship tournament. Truckee doubles partners, senior Kira Collins and sophomore Lilah Abarno, entered this year’s regional tournament undefeated on the year as a tandem and the No. 1 seed. The two reached the finals of the tournament relatively unchallenged, and after the opening set, appeared to be on their way to winning the championship. Instead, Churchill County’s Allison Frost and Brooklynn Whitaker swung the momentum in their favor, winning the second set 6-2 to force a tiebreaker. The Greenwave duo would go on to break Truckee’s serve to win this year’s regional championship, 6-4. Both teams, along with Incline’s Carolyn Eppolito and Melanie Racich, and South Tahoe’s Alyx Carlson and Nicole Morgan, qualified for next weekend’s state tournament. After finishing as a runner-up last year, Incline senior Kate Tong captured the Northern League singles championship, defeating South Tahoe’s Kayla Mason in one of the tournament’s best matches. Mason won the first set 6-4, but Tong bounced back in the second, winning 6-1. The Highlanders top player would go on to capture this year’s league title, taking the final set 6-2. The two players will be joined at the state tournament by South Tahoe’s Sierra Dahl and Incline’s Millie Jenkins. 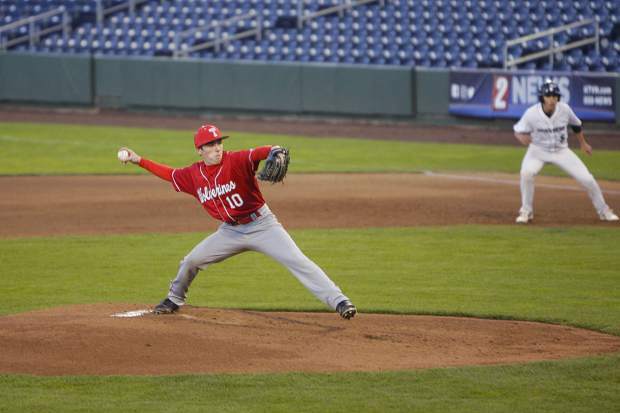 The Class 3A state championship tournament began Thursday with the team tournament. The finals take place today, along with the state singles and doubles tournament will get underway. The finals of the tournament are scheduled for noon Saturday.